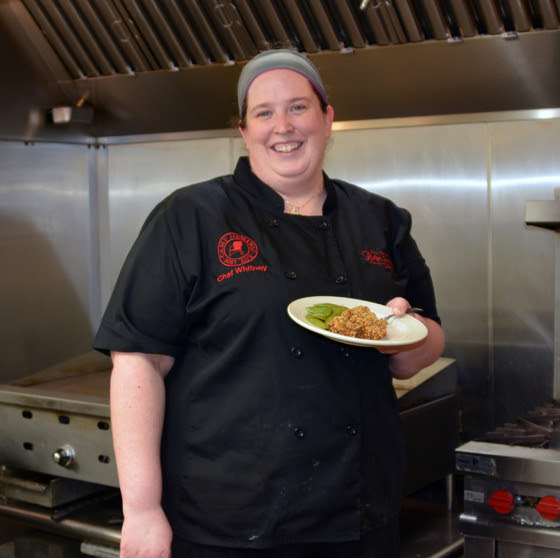 Whitney Saylor is our newest team member at Camp Newaygo, starting the summer with a bang as our Executive Chef of Ridge Specialties. Whitney has roots in West Michigan; she was born in Holland and has family in the Grand Rapids area. As a graduate of the Culinary Institute of Michigan, Whitney started her career with the Gilmore Collection working at The Bob. She continued to develop her culinary skills at places like Soaring Eagle and Disney World. She also has experience from the other side of the kitchen – working the “front of the house” throughout her career – which helped her learn the importance of the experience when it comes to dining. Whitney comes to us from Lucy’s Cafe in Grand Rapids, where she had not one, but three titles: Executive Chef, General Manager, and Event Coordinator. She is very excited to send her daughter Brooklyn to camp when she is older. Brooklyn, 5, is starting school this year and is already making friends with the staff and the camp pets. She is always asking to pet Captain, Jalisa’s Dalmatian, or the miniature horses, which got special nicknames for the summer (our favorite was “Speedy Steve”). Whitney has had a packed summer learning the ins and outs of camp life, and will now concentrate on continuing to grow Ridge Specialties. She specializes in baking, and her favorite dish to make is biscuits and gravy. Her favorite part of camp so far is the relaxed atmosphere, and the sense of community. We are excited to have Whitney on our team, and we can’t wait for you to join us for dinner!